Η παγκόσμια επιστημονική κοινότητα ενημερώνεται για τις διαρκείς ερευνητικές εξελίξεις μέσω επιστημονικών άρθρων, τα οποία δημοσιεύονται σε έγκριτα επιστημονικά περιοδικά. Η σημασία των επιστημονικών άρθρων, και η επιστημονική έρευνα την οποία περιγράφουν, αξιολογούνται λεπτομερώς με αυστηρότατα κριτήρια από τουλάχιστον 2 ή 3 ειδικούς επιστήμονες/καθηγητές από όλο τον κόσμο προτού γίνουν αποδεκτά για δημοσίευση, εξασφαλίζοντας έτσι ότι το συγκεκριμένο άρθρο είναι μοναδικό και προσφέρει στην επιστημονική κοινότητα κάτι καινούργιο και πρωτοποριακό. Η δημοσίευση των ερευνητικών μας άρθρων, ιδιαίτερα σε περιοδικά παγκοσμίου φήμης, αποτελεί επιστημονική καταξίωση για την ομάδα της «Ευγονίας». Οι δημοσιεύσεις μας προσφέρουν στην παγκόσμια επιστημονική κοινότητα νέα τεχνογνωσία όσον αφορά πρωτόκολλα διέγερσης ωοθηκών, ασθενείς με πτωχή απόκριση, πολυκυστικές ωοθήκες και σύνδρομο υπερδιέγερσης ωοθηκών, τα οποία αφορούν μια μεγάλη μερίδα των γυναικών που υποβάλλονται σε Υποβοηθούμενη Αναπαραγωγή. Τα άρθρα αυτά, για τα οποία είμαστε υπερήφανοι, αντανακλούν σε μεγάλο βαθμό την βαθειά γνώση του αντικειμένου, την άριστη επιστημονική και τεχνολογική κατάρτιση, και τον διαρκή αγώνα που καταβάλλεται από όλα τα μέλη της «Ευγονίας», Ιατρούς, Εμβρυολόγους και Μαίες, για διαρκή βελτίωση και προσφορά άριστων υπηρεσιών στα ζευγάρια που μας εμπιστεύονται. Complex chromosomal aberrations in a fetus originating from oocytes with smooth endoplasmic reticulum (SER) aggregates. Blastocyst utilization rates after continuous culture in two commercial single-step media: a prospective randomized study with sibling oocytes. Basal serum progesterone and history of elevated progesterone on the day of hCG are significant predictors of late follicular progesterone elevation in GnRH antagonist IVF cycles. Venetis CA, Kolibianakis EM, Bosdou JK, Lainas GT, Sfontouris IA, Tarlatzis BC, Lainas TG. Estimating the net effect of progesterone elevation on the day of hCG on live birth rates after IVF: a cohort analysis of 3296 IVF cycles. Reply: Modified natural cycles for poor responders: addressing misconceptions and fallacies. Kolibianakis EM, Lainas TG, Venetis CA. No evidence that embryo selection by near-infrared spectroscopy in addition to morphology is able to improve live birth rates: results from an individual patient data meta-analysis. Vergouw CG, Heymans MW, Hardarson T, Sfontouris IA, Economou KA, Ahlström A et al. Flexible GnRH antagonist protocol versus GnRH agonist long protocol in patients with polycystic ovary syndrome treated for IVF: a prospective RCT. Initiation of GnRH antagonist on Day 1 of stimulation as compared to the long agonist protocol in PCOS patients. A randomized controlled trial: effect on hormonal levels and follicular development. In a flexible antagonist protocol, earlier, criteria-based initiation of GnRH antagonist is associated with increased pregnancy rates in IVF. Osseous metaplasia: case report and review. Blastocyst development in single-step versus sequential culture media: a prospective randomized study with sibling oocytes. Are pregnancy outcomes affected by the presence of hysteroscopic findings in asymptomatic women undergoing in vitro fertilization treatment? Basal progesterone levels represent the only independent risk factor prior to initiation of stimulation for elevated progesterone on the day of hCG. The true impact of elevated progesterone on the day of hCG on pregnancy rates after IVF: a cohort analysis of more than 3,600 cycles. Effect of granulocyte-macrophage colony-stimulating factor (GM-CSF) on pregnancy rates in patients with multiple unsuccessful IVF attempts. Μασουρίδου Σ., Κολυμπιανάκης Ε., Κύρου Δ., Σφοντούρης Ι., Βενέτης Χ., Λαϊνάς Γ., Ζεπειρίδης Λ., Μπίλη Ε., Γκριμπίζης Γ., Μιτσόλη Α., Σανοπούλου Θ., Πάγκου Θ., Λαϊνάς Τ., Ταρλατζής Β. 12ο Πανελλήνιο Συνέδριο στη Μαιευτική και Γυναικολογία, Θεσσαλονίκη, 17-20 Μαΐου 2012. Sfontouris I. A., Lainas G. T., Sakkas D., Iliadis G. S., Anagnostara K., Zorzovilis I. Z., Petsas G. K., and Lainas T. G. Human Reproduction 2011; 26: i86. Nominated for the "Fertility Society of Australia Exchange Award"
Treatment of peritoneal and ovarian endometriosis by using CO2 laser with or without 'swiftlase'. Lainas, G. Petsas, I. Stathopoulos, N. Bournas, S. Eliadis. 6 - 9 Dec. 1995. Microsurgery in the treatment of tuboperitoneal infertility. Sarris, T. Lainas, G. Alexandrakis, S. Eliadis and A. Comninos. III World Congress of Reproduction, Berlin 22-23 March 1981. Tubercolosis of the female genital system. M. Al-Achmant and S. Sarris. Treatment of pelvic pain by ablation of the uterine nerve using Laser-Laparoscopic surgery (L.U.N.A.). L.U.N.A. (Laser uterine nerve ablation) for the treatment of severe dysmenorrhea - dyspareunia. Rectovaginal septum endometriosis. Diagnosis and treatment. Bicornis-bicervical uterus with or without haematocolpos. Treatment of peritoneal and ovarian endometriosis using Swiftlase. Cervical sarcoma in a 15 year old girl diagnosed using hysteroscopy. Pelvic infection disease and perihepatitis. 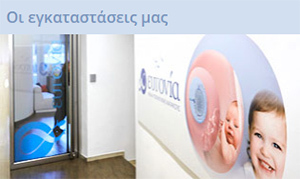 Two years experience of a laparoscopic surgery unit at Athens Maternity hospital (video). Laparoscopic management of ovarian cysts performed with the method of double suction using Nezhat probe without content spilage. Hysteroscopic diagnosis and treatment of endometrial cavity pathology. Laparoscopic diagnosis and treatment of subtle lesions of peritoneal endometriosis. Curtis-Fitz-Hugh syndrome and chlamydial pelvic infection. Laparoscopic treatment of ectopic pregnancy. Laparoscopic treatment of peritoneal and ovarian endometriosis using Laser CO2. Referral frequency for obstetric ultrasound, pregnancy DOPPLER and biophysical profile. Delay of labour initiation and biophysical profile. Diagnosis of vaginal adenosis using the microhysteroscope Hamou II. Tuberculosis of the female reproductive system. Microsurgical treatment of tuboperitoneal infertility. Haematological changes during normal gestation. The value of laparoscopy in the investigation of female infertility. Microsurgical treatment of female infertility. Laparoscopic investigation of 270 cases of female infertility.